Determining the right road trip vehicle is subjective. You need to decide: What you are trying to get out of your road trip? If saving money on fuel is your thing, a hybrid like a Toyota Prius or a diesel like the Chevrolet Cruze is most likely your best option. If you are looking to carve up the back roads, you might try a BMW M2 or Cadillac CTS-V. If you are looking to bring all your buddies from college to a bunch of breweries, we wouldn't hesitate directing you towards a Chevy Suburban. But none of these are necessarily a better road trip ride than the other. As the resident "truck guy" at The Drive, I felt it was only appropriate to opt for a pickup for my latest road trip rig. 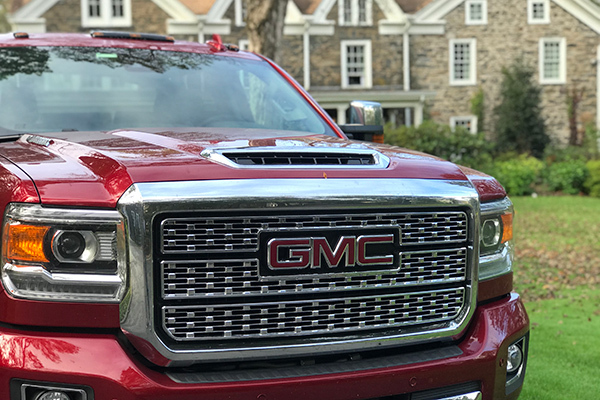 GMC was kind enough to loan me the 2018 GMC Sierra 2500HD Denali for my recent adventure. 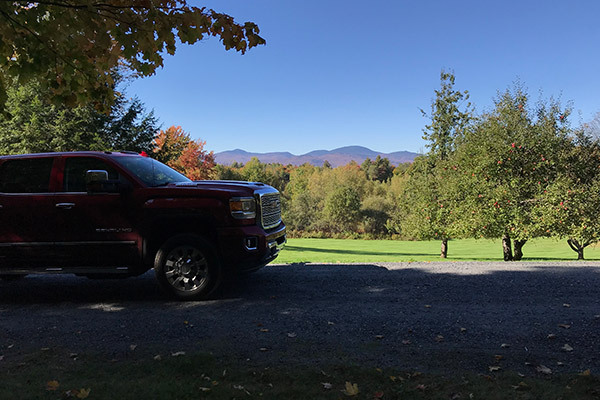 With the truck equipped with a 6.6-liter Duramax diesel V-8 making 445 horsepower and 910 lb-ft of torque, connected to an Allison transmission, my girlfriend and I had more than enough power to conquer New England. 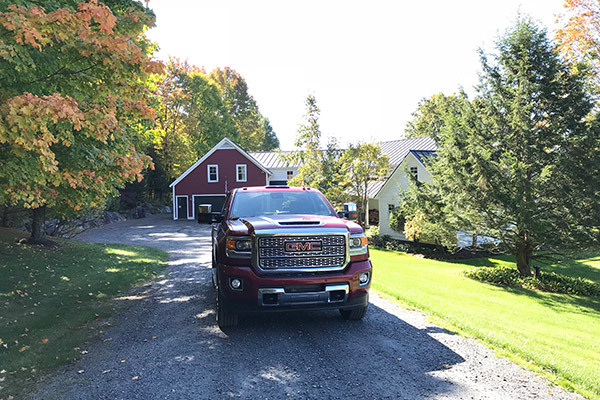 On a lengthy journey from the NYC area to Sharon, Connecticut, then to Stowe, Vermont, and finally to Stone Ridge, New York, we logged serious miles (over 700) on the massive pickup truck. If you are able to swing diesel pricing and aren't afraid of a sub-20-mile-per-gallon real-life fuel economy (we observed 19.5 mpg), than you may be pleasantly surprised with the Denali's capability as a vacation hero. (Before someone says, "Duh, it's designed for long hauls," I want to remind everyone that a truck hauling heavy items and one free of payload behave very different, and should be judged accordingly.) 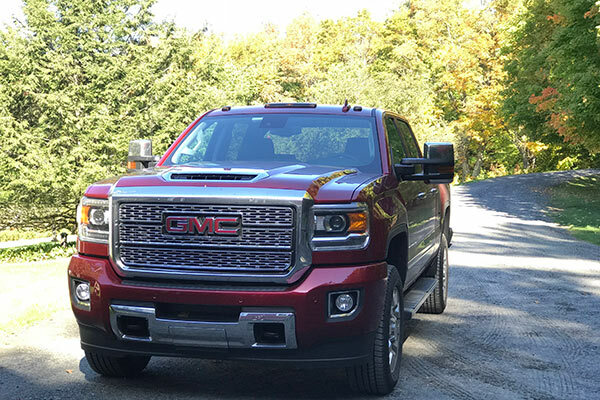 Although it rode like a truck and had a little bounciness to the ride, we enjoyed the road manners of the GMC Sierra 2500HD Denali. Thanks to a re-enforced chassis, heavily-insulated cabin, and sound-deadening engine covers, I didn't feel like a logger whenever I was pulling into town; likewise, highway noise was no louder than your average SUV. Still, each time I laid on the accelerator, I was greeted with the distinct diesel clang, turbo spool and impressive pulling power of the 910 lb-ft of torque from the Duramax. The infotainment system was intuitive and a pleasure to use during the time we chose not to use Apple CarPlay (which, as I've mentioned before, I'm not a fan of). At no point did I find myself cursing a piece of technology, as I have done with—ahem—certain British car brands. The climate control could be adjusted via knobs or the touchscreen, depending on your personal preference. Likewise, the high-tech safety features—ones like lane departure warning, 360º parking sensors, and front collision warning—were helpful, and not too invasive. I had no complaints with the heated and ventilated leather seats that come as part of this GMC's Denali trim. One handy feature that's true of all 2018 GMC Sierra 2500HD rear seats: The ease with which they fold up, yielded a cavernous storage area that helps make any road trip a breeze. It's a huge plus if your truck doesn't have a bed cover, or if you're fifth-wheeling a trailer. Having driven the 2500HD before and testing it in more work-related capacities, taking a long road trip gave me the chance to think about how well the heavy-duty Sierra performs in both personal and work capacities. Even though many might take issue with the arguable absurdity of the 2018 GMC Sierra 2500HD Denali's price—it starts at $69,685, more than a Porsche 718 Boxster S—it's important to note the extra $20,000 you'd spend on the Denali over a base 2500HD work truck isn't the most outrageous cost in the world if you use it at a both a work truck and a personal vehicle. Especially compared to owning two vehicles. That being said, the $71,000-as-tested price of my 2018 GMC Sierra 2500HD Denali road tripper is a big kick in the...bank account. For the record, don't take my autumn road trip to suggest I'm an advocate of the sparkling-clean pickup bed. I strongly believe trucks should be used as tools—but I don't think they should be precluded from going on adventures. The 2018 GMC Sierra 2500HD is clearly geared to haul massive loads—construction equipment, farm animals, the family yacht—but it still can calmly cruise along mountain roads with an empty bed without vibrating your intestines into a smoothie. And at the risk of sounding...basic, it was nice to know my girlfriend and I had a pickup bed to house any spontaneous antiques we purchased from one of the many establishments we darkened the door of during our multi-state adventure. The real takeaway: Any type of vehicle can be the perfect road trip car, depending on your preferences and requirements. I needed a vehicle that could carry me and my girlfriend, along with seven days of luggage; one capable of driving down trailhead roads before and after our obligatory New England hikes; and one without so much engine and exhaust noise that you need earpieces to talk to your passengers. 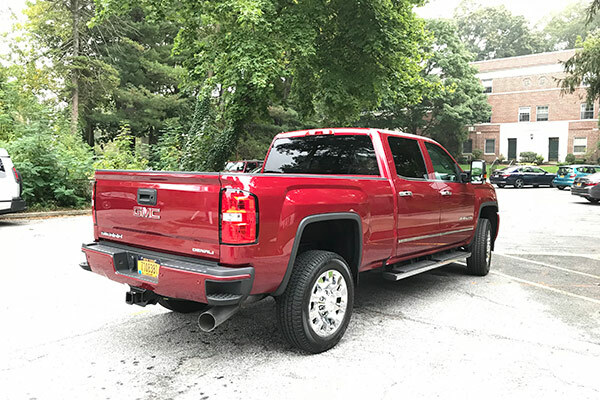 Fortunately, the 2018 GMC Sierra 2500HD Denali covered all that—and left me grinning every time I got behind the wheel. Like what you saw here? Then click here for an in-depth review of the 2017 GMC Sierra 2500HD Denali. 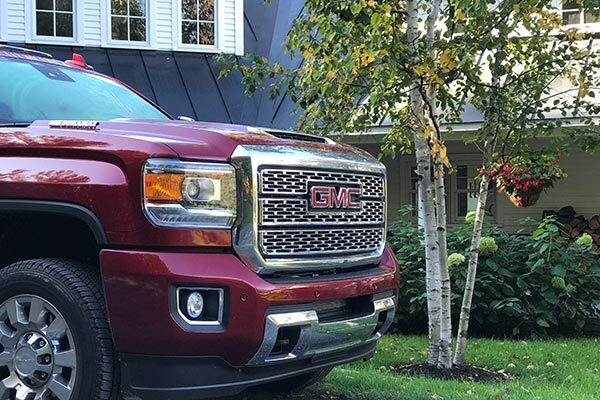 Random fact: People in New England turn their heads more for a GMC Sierra Denali than they do for most sports cars. A lil crossover slotted below the Terrain could print money for GM's truck and SUV brand. General Motors has learned not to mess with a good thing.